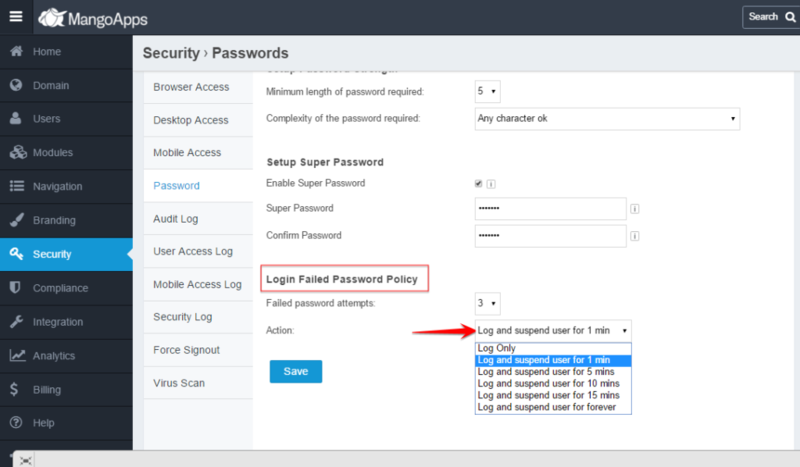 /Security & Compliance /How Can Network Admin Configure Password Strength and Policy in Mangoapps? MangoApps allows ‘Network Admin’ to impose conditions on Password Strength & Policy from the Admin Portal for enhanced security. This can be achieved by Navigating to ‘Admin Portal > Security > Password’. Increase the length and strengthen the complexity of the passwords your users are required to use to login. This makes it harder for a user to guess someone else’s password making your user accounts more safer. Super password allows you and other domain admins to login as any user in your domain. With a user’s login id and the super password, you can login as that specific user. Setup to automatically suspend users after a certain number of incorrect password attempts. The user’s account is de-activated for the specified period of time or until a domain admin activates it again. For example, each additional attempt could result in a longer lock time. How Do I Configure Usage Policy?